Well, let’s start it off with. . . . . .something else. I link this not really because it has any particular archaeological significance, but he was part of a whole milieu back in the late 1980s and early 1990s that kind of set me on my path. Not archaeology — I was already on that — but rather to my entire side (some would say main) career path working with computers. ‘N junk. Regulars may recall that I started undergraduate school as a computer science major, but ended up in archaeology because it interested me far more than programming ^$)#ing linked lists in ^$)#ing assembly language. Anyway, a few years into grad school my funding sucked, my faculty advisor was an alcoholic, and I needed to earn a living, so I ended up by chance with a Large City’s Department of Public Health analyzing data. First on an old IBM mainframe and then we moved to PCs running. . . . .OS/2. Having been a Vax guy, I adored OS/2 and thought Windows was nothing more than DOS in a clown suit. And thus I entered unto the Great OS Wars of the 1980s and 1990s. Anyway, Pournelle: He used to have a column in the old Byte magazine (ha, look what’s in the top row there). He was an exceptional writer for a magazine like that, not some technical mumbo jumbo or rehashed advertising copy; his columns told a story. In a way, they were almost all the same: He’d describe how he changed something in his Windows network — say, adding a video card — and then the network wouldn’t work, and he’d spend the next week tracking down what was going on and calling tech support (they used to have such things back then), and flipping dip switches, and blah blah blah, until he finally got it going again. Which is a big reason I thought Windows was nothing more than DOS in a clown suit. He gave OS/2 a try and was actually fair in his “review”, unlike most other @sshats who would just say “It’s not like Windows so it sux” and leave it at that. He did spend some time getting it up and running but then he admitted it was quite stable and just chugged along. And then he forgot about it and wrote more columns about Windows ^$)#ing up (Note: I’ve gotten a bit more of a potty mouth in the last few months; please bear with us — Mgmt). I guess the point of all this is that the whole period back then got me on the whole mostly non-academic route I’ve continued on to the present. As y’all know, I’ve linked to a lot of stories on the academic meltdown (as I see it) over the last couple of decades; that stems from having spent a lot of time in the Real World while having a foot in academia as well. And Pournelle was a memorable part of that whole process of extracting myself from the world of pure academia. I liked, but was not fascinated with, Lucifer’s Hammer (which kinda scared the dickens outta me), The Mote in God’s Eye (which had some neat, if really flawed, ideas about cultural evolution), and probably the most disturbing one, Inferno, which also kinda creeped me out. It’s basically a sci fi retelling of Dante’s Inferno but with modern sins and punishments. I finally got around to reading Dante’s version a while ago; tough reading but worth it. Definitely read that one if you pick any of them. Might be dated, but it’s still good I think. So, RIP, dude. You done good. A couple of Modern Artifacts. And maybe some incipient abandonment. Still in Wisconsin and thought I’d toss out a couple of trivialities that might be worthy of interest. Only one has seemingly archaeological implications. I even did a little bit in COBOL once. Lawdy what a mess. In the mobile Internet age, checking email is simultaneously a nervous tic and, for many workers, a tether to the office. A person’s email inbox is where forgotten passwords are revived; where mass-mailings are collected; and where pumpkin-pie recipes, toddler photos, and absurd one-liners are shared. The inbox, then, is a place of convergence: for junk, for work, for advertising, and still sometimes for informal, intimate correspondence. Email works just the way it’s supposed to, and better than it used to, but people seem to hate it more than ever. Over the course of about half a century, email went from being obscure and specialized, to mega-popular and beloved, to derided and barely tolerated. With email’s reputation now cratering, service providers offer tools to help you hit “inbox zero,” while startups promise to kill email altogether. It’s even become fashionable in tech circles to brag about how little a person uses email anymore. I don’t hate email. Never did. I love email. I can communicate with someone who’s not right there and can compose thoughtful responses (or not, I suppose) instead of having to respond right now on the phone. I can send said communication to the other side of the planet nearly instantaneously. I can send files with it so we’re talking about the same thing. It’s abused, obviously — what isn’t? — but I’ve managed to keep at least my main email relatively free from spam. And it takes a bit more thought to create words that mean what you’re really trying to convey; it’s not just typing what you’re thinking (or shouldn’t be, most of the time). But it still rocks. I’m putting this out now. . . .
Today’s discerning beer drinkers might be convinced that America’s watery, bland lagers are a recent corporate invention. But the existence of American beers that are, as one industry executive once put it, “less challenging,” has a much longer history. In fact, Thomas Jefferson, himself an accomplished homebrewer, complained that some of his country’s beers were “meagre and often vapid” nearly 200 years ago. Jefferson never lived to see the worst of it. Starting in about the mid-1800s, American beer has been defined by its dullness. Why? The answer lies in a combination of religious objections to alcohol, hordes of German immigrants, and a bunch of miners who just wanted to drink during their lunch break, says Ranjit Dighe, a professor of economics at the State University of New York at Oswego. I downloaded the paper and may put it up for downloading so y’all can read it as well (for Educational Purposes). Having gone through the paper — which this article does a decent job of summarizing, in the main — and still haven’t made up my mind on it. The underlying assumption seems to be that, well, “Americans have this funny taste for bad beer just because of various historical things and if they’d (we’d) just get used to it we’d ignore all those nasty light pilsners and take up hearty ales and porters and such like Civilized People.” It seems like an awful long time for us to be liking these things to just lay it at the foot of economics. I wonder if there isn’t something more biological involved. Or perhaps sociobiological. I dunno. Perhaps he’s right and there’s a whole mess of historical reasons. But I found it fascinating. 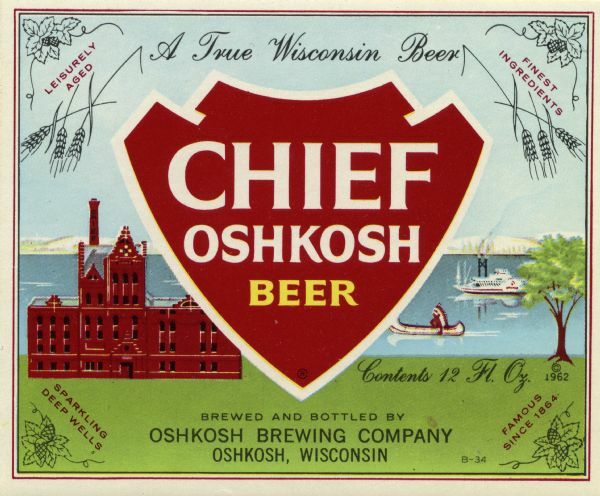 BTW, I tried a new beer to brew yesterday: Chief Oshkosh. I never actually drank any of it, but I do remember seeing the signs around Wisconsin when I was a kid. 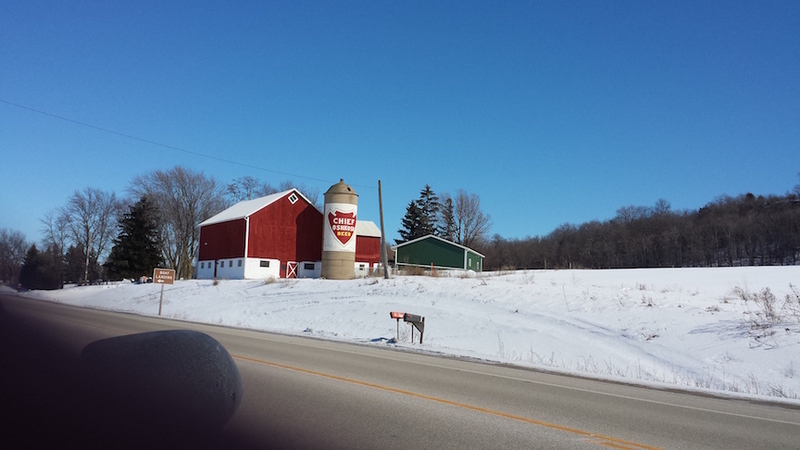 I think there’s even a silo between Fond du Lac and Oshkosh that still has the logo on it. It went out in the early 1970s so it was before I was of age. Don’t think my relatives drank it either. But I wanted a simple recipe to try and I’ve been meaning to try one of the mid-century regional beers. The recipe is at the link above. Will find out in a couple weeks how it worked. If it’s reasonably decent, I may use it as a base to experiment and make it my Signature Brand, if you will. I also watched Strange Brew this weekend, and so whenever I get the recipe down I think I shall call it Chief Elsinore Beer/Bier. Heh. This distinction isn’t as widely understood as it should be. 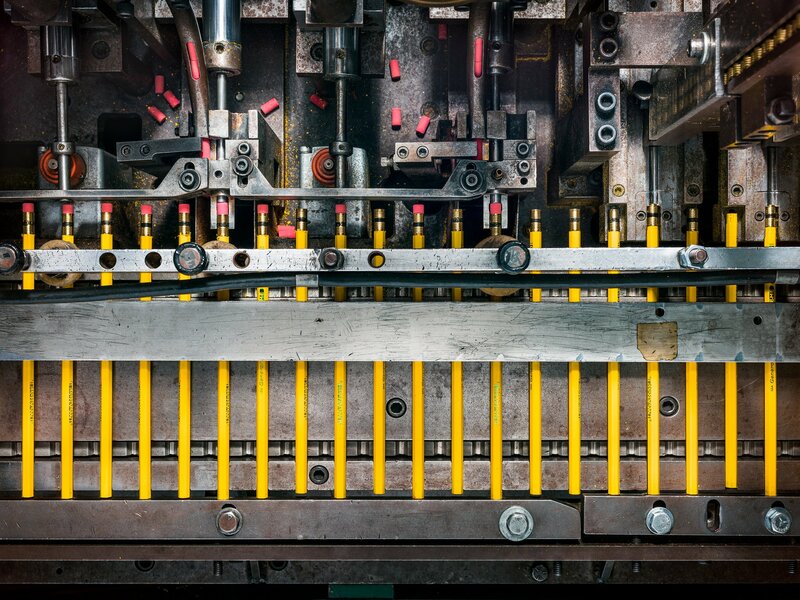 Most new technologies make our lives easier without changing them other than superficially. The compact disc, for example, was a convenience, not a revolution. Unlike the iPod, it didn’t alter our relationship to the world of music. The answering machine, by contrast, really did transform the way in which we used the telephone by making it possible to screen incoming calls. As soon as that possibility became a reality, the place of the telephone in daily life underwent a profound change, and never changed back. Not everyone is open to such change. Sooner or later each generation comes to a great technological divide, a chasm that most of its aging members are unable or unwilling to cross. For my mother, who was born mere weeks before the Great Depression, that chasm was the invention of the personal computer. She owned an answering machine—I bought it for her—but she never screened her calls, nor did she learn how to use a computer. When the PC became a routine part of American life, she was officially old. The world had passed her by. The author and I are kind of in the same boat, roughly the same age, and we’ve noticed the same things. 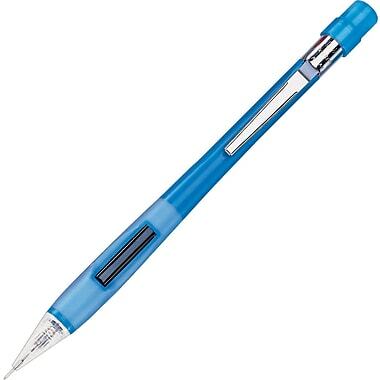 I recall when I first wrote something on a computer — actually, with a halfway decent word processor (WordPerfect 5.1, which roooooolz) — and I thought that it changed everything. I could cut and paste text! I could delete it completely! NO MORE WHITEOUT! I didn’t do too much writing on a typewriter, to be honest. I guess in college I did some papers on one, but I don’t remember spending a whole lot of time on them. But I adapted to computers and the Internet easily. I also adapted to iPods (and the like) and smart phones, although I took my time with those because frankly I didn’t really need one until I started doing CRM. Nowadays I text like a sumbitch. I adopted Facebook and blogging, but not Twitter or Instagram. I happily read books on an iPad. I have, however, promised myself (or perhaps it never occurred to me) that I shall never Act Old. I am not going to be one of those people who have no clue about [insert modern technology here]. I may not use them all, but I’m not going to be stuck in the comfortable past. Interesting observation also on how certain technologies change the way we do things, as opposed to just making incremental changes to things we already do. You can apply this to the past, obviously. Ceramics, when being made as maybe heating stones, didn’t really change anything, but once people started making vessels out of them it opened up a whole new range of activities. I’m sure some archaeologist somewhere has come up with a whole terminology for this. . . . While I hate to link to Slate. . . . There are many irritating things about this article. The irony of congratulating yourself on sticking to 1880s technology in a piece circulated on the Internet is an obvious place to start. Yeah, you can kinda sorta get something of the flavor of a period but it’s extremely difficult to really live it in any realistic sense. As I found when I tried to Live Like The 1980s I found that there were myriad little things to consider, most of which would have — back then — been part of the everyday warp and weft of society. If one were to live 1880s style, for example, one would have very limited access to certain foods that we now take for granted: fruits and vegetables would only be available in certain times of the year depending on where you lived. As she mentions, medical care would have been extremely primitive as well. I won’t decry the attempt too much, however, unless they’re really being smug about it. It’s an interesting exercise to try to do something like that (as I found out) and it can be kind of fun. What makes Dune more palatable than, say, the gruesome spectacle of a blonde-wigged Emilia Clarke carried aloft by ethnically indeterminate brown slaves in Game of Thrones, is the sincerity of Herbert’s identification with the Fremen. They are the moral centre of the book, not an ignorant mass to be civilised. Paul does not transform them in his image, but participates in their culture and is himself transformed into the prophet Muad’Dib. If Paul is one-part Lawrence of Arabia, leading his men on to Aqaba, he is also the Mahdi. Dune glosses this word as “in the Fremen messianic legend, The One Who Will Lead Us into Paradise”. In Islamic eschatology, the honorific Mahdi has a long and complex history. Various leaders have claimed or been given it. Most Shia identify the Mahdi with the 12th or Hidden Imam, who will imminently reveal himself and redeem the world. To the British, it will always be the name of the warrior prophet who swept through the Sudan in the 1880s, killing General Gordon on the steps of the palace in Khartoum and inspiring a thousand patriotic newspaper etchings. As Paul’s destiny becomes clear to him, he begins to have visions “of fanatic legions following the green and black banner of the Atreides, pillaging and burning across the universe in the name of their prophet Muad’Dib”. If Paul accepts this future, he will be responsible for “the jihad’s bloody swords”, unleashing a nomad war machine that will up-end the corrupt and oppressive rule of the emperor Shaddam IV (good) but will kill untold billions (not so good) in the process. In 2015, the story of a white prophet leading a blue-eyed brown-skinned horde of jihadis against a ruler called Shaddam produces a weird funhouse mirror effect, as if someone has jumbled up recent history and stuck the pieces back together in a different order. When did I first read this? Must have been in the later 1970s when I went through my big SF phase. I admit I’ve read nearly all of the sequels including the finale (sort of) and all of the backstory novels. There are still a couple out there that I haven’t read yet, recent ones about Paul’s years out in the desert, etc. Sci-Fi also did a miniseries of it in 2000 which was more faithful to the book (also a 2003 followup, which was the better of the two IMO). I think they did a far better job translating the book to the screen and the whole thing looks better than the other one, but I mostly hated the casting; just none of them really worked. That never occurred to me but now that they mention it. . . . There was also a National Lampoon spoof of it, Doon, most of which was forgettable, but I think of whenever I pour something out of a tap and tip the glass to keep the foam down. If you’ve read it, you’ll remember that bit. Still gives me the giggles. *sigh* I suppose I shall have to read the other books at some point. I don’t read much fiction and then only science fiction (mostly, except for classical literature), so I’m probably missing out a lot of good stuff by only reading these things.